You can also perform a more selective search for churches in the Blyborough area or see them printed on a map. The Anglican church is dedicated to Saint Alkmond (or Alkmund). The original church was apparently built in Norman times, prior to 1312. The church was rebuilt in 1877. It is primarily built of stone. A photograph of St. Alkmond church is at the Wendy PARKINSON English Church Photographs site. Richard CROFT has a photograph of St. Alkmond's Church on Geo-graph, taken in 2005. He also has a photograph of the church interior on Geo-graph, taken in 2012. Jonathan THACKER has a photograph of the church tower on Geo-graph, taken in August, 2010. The Anglican parish register dates from 1691 for marriages and from 1791 for baptisms and burials. The London Family History Centre has the Bishop's Transcripts for 1599 through 1830 and the parish registers for 1691 through 1759. The Lincoln Archives has parish register for 1785 through 1812. 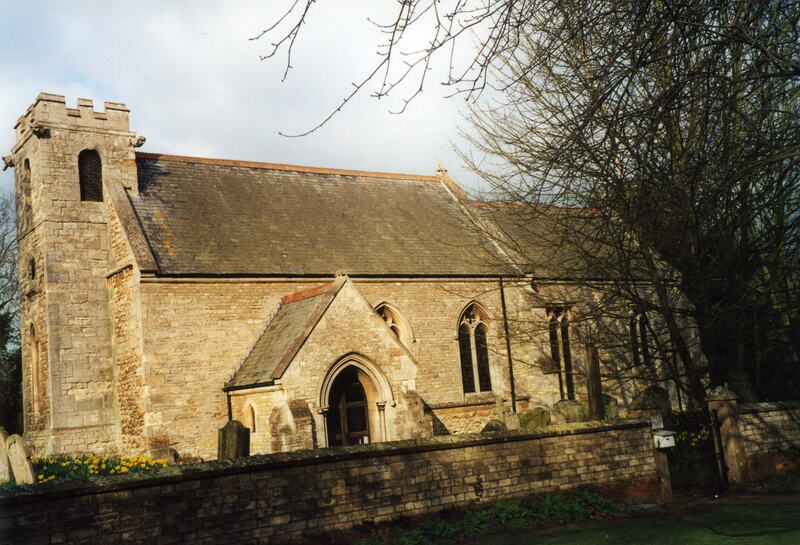 The Lincolnshire FHS has a Loan Library service which has the parish registers on microfiche for baptisms from 1813 to 1966, marriages from 1813 to 1837 and burials from 1813 to 1993. Information on present church services and contact information can be found on the Anglican Diocese web site. Blyborough is a village and parish which is just east of Gainsborough by about 9 miles, and 16 miles north of Lincoln. The parish covers about 2,350 acres. By automobile, the village is on the B1936 just 9 miles east of Gainsborough. Google has a number of photographs around the parish and a couple of old maps, as well. Ask for a calculation of the distance from Blyborough to another place. You can see the administrative areas in which Blyborough has been placed at times in the past. Select one to see a link to a map of that particular area. In 1882, the principal landowner was George Augustus LUARD of Blyborough Hall. Blyborough Hall is an ancient mansion, built of stone. It was formerly the seat of the SOUTCOTE and BOURRYAN families. In 1882 it was the residence of George Augustus LUARD. The Hall is a Grade II listed building with British Heritage. Two brothers fought in the Penninsular War and at Waterloo. Those two were Lieutenant John LUARD of the 16th Light Dragoons, and Captain George LUARD of the 18th Hussars. Both survived the war. They are memorialized in a stained glass window in the church. A yew tree in the churchyard, over 200 years old, is a memorial to "all who gave their lives for this country and freedom." The Royal Flying Corps laid out an airfield here in October, 1916. The airfield closed in February, 1918. Richard CROFT has a photograph of the churchyard War Memorial on Geo-graph, taken in 2012. Tony HIBBERD has a photograph of the STRAWSON Memorial on Geo-graph, taken in June, 2013. Four LUARD family members are recorded on this memorial inside the church on Flickr, taken in 2008. The citizens of Blyborough have decided to have periodic Parish Meetings rather than a formal Parish Council. They will NOT do family history searches for you. In 1834, with the passage of the Poor Law Amendment Act, the parish became part of the Gainsborough Poor Law Union. Ros DUNNING provides a transcript of the will of ACKRILL, Benjamin of Blyborough. The first parocial school, a National School, was built here at the expense of George A. LUARD in 1871. It could hold up to 60 children.